The scattered village of Kilninian lies on the west coast of Mull overlooking Loch Tuath and the island of Ulva. The parish church was built in 1755, ten years after the Jacobite Rising. It is one of the oldest and, until very recently, still used for worship. 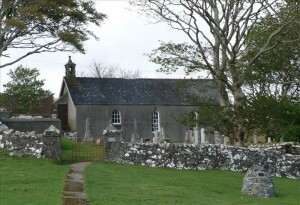 Possibly standing on the site of an earlier medieval church, it first appears in the records of 1561, where it is stated that the parsonage of ‘Keilnoening’ had formerly belonged to the Abbot of Iona, one-third of the revenues going to the Bishop of the Isles as was customary in the diocese. Iona Abbey would have appointed a minister for the church at a stipend lower than the tithes. It is uncertain whether the church was dedicated to St Ninian, the apostle of Galloway, or to a local saint of the Early Christian period. It is also believed to have once been known as ‘The Chapel of the Nine Maidens’, or in Gaelic ‘Cill Naoi Nighean’, although another possible name was ‘The Church of the Holy Maidens’ or ‘Cill Naoimh Nighean’. The most well known minister of the Kilninian parish, which included Kilmore Parish Church, was John Beaton, a member of the famous Mull family from Pennycross. He was minister from 1679-1701. The church, measuring 15.2 m by 6.4 m, is built of harled masonry, has an 18th century bell-cot on the east gable and is of unpretentious construction. The interior has been almost completely refurbished, so that the original fabric is not apparent. However, the seating is believed to have been made of pine from a shipwreck and the west gallery is approached by an external stair, which is probably 19th century. A long communion-table is also of the same period and can be seen at the Museum of Country Life at Kitlochside, East Kilbride. The communion cup is on display in Mull Museum, Tobermory. There are eight interesting medieval slabs mostly of the Iona school, 14th-15th century. Unfortunately the names of the people they commemorate are unknown. One is a full-length effigy of a warrior in armour ‘with pointed basinet, an aventail and a knee-length aketon and carries a claymore’. He has a tasselled cushion under his head and a hound at his feet. There are a mirror and a pair of shears on another slab. These grave slabs have been moved to the vestry at the back of the church for protection. There is also a late medieval dial or ‘mass-clock’ carved on the smoothest face of an irregular lava boulder some 0.65 m in length. It is similar to one carved on a cross-base at Iona, being divided into twenty-four segments by lines radiating from a small central socket. Some of the lines are repeated, possibly as a result of re-cutting. There are two outer circles with five small crosses carved outside the perimeter of the dial. A late 16th-17th century tapered slab shows a crude, full-length effigy of a man, believed to be a smith. He is wearing a conical helmet, which does not cover his ears, and a knee-length tunic, and is holding the hilt of a claymore. Between his feet is an anvil. There are also several 18th century monuments to the Macleans of Torloisk and a modern one to the 18th MacLean of Ardgour. The chapel is now privately owned, but there is access to the vestry to see the above grave slabs.